Living roof maintenance seems to be shrouded in mystery. Does a green roof need maintaining? How often? How expensive is it? Who’s responsibility is it? These often unanswered questions can result in a desire to move away from having a living roof in the first place. Maintenance for a living roof needs to be considered from the outset. There is no such thing as a 'no' maintenance roof, green or otherwise. All new commercial buildings are required to have roof and gutter checks twice a year and an extensive green roof can be designed to align with this requirement. The maintenance required will depend on the outcome desired by the client. Get a free maintenance quote today! There are ways that green roofs can struggle, whether they are water logged through poor outlet placement, burnt to a crisp due to a lack of irrigation or ‘trashed’ following installation by other trades. This is an example of one such roof that was left to burn to a crisp last summer (2013) where it received little rain and was neglected to the point where the owner thought the roof was dead. FEAR NOT. Sedum is an extremely robust plant, and with a little TLC from our maintenance team this is what can be achieved in 6 months. The before and after shows what a little feed and plug plant can do to bring a roof round to full health. Contact us if your roof is in a similar state of ‘sadness’ and you would like us to bring it back to life. We recommend biannual visits to our sedum blanket or plug plant roofs to clear any weed infestation, and one application of fertiliser in the early spring, in time for the growing season. 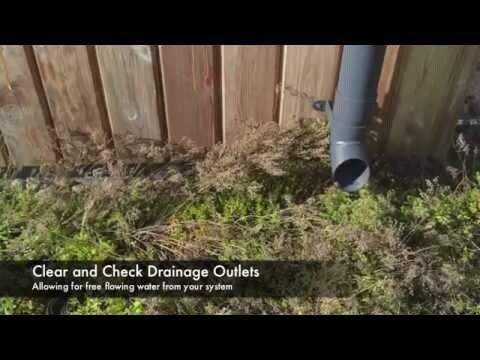 Drainage outlets and inspection chambers cleared of vegetation, as with any roof. Ensure riverstone perimeters are clear of dead and live plants. Sedum roofs should maintain their lush, and healthy sedum coverage. Infestations of grass and other weeds will soon die off due to insufficient substrate depth and become unsightly. Biodiverse roofs are generally seen to have lower-maintenance demands, but will still require a visit once or twice a year to cut and remove the seasons growth. This encourages the spread of seed for the next season and removes the dead unsightly flower heads. Drainage channel and gutter clearance to remove any unwanted debris or leaf litter will also be carried out on regular maintenance visits. The beauty of a Biodiverse living roof is observing the natural progression of the roof through the seasons and over many years. From one season to the next different plants will dominate and subside as the roof finds a balance with its environmental surroundings. Most semi intensive or intensive green roofs are designed with aesthetic appeal or the functionality of normal garden or recreational area which will dictate a more intensive maintenance regime, as would be required in most gardens. Access to a water point is essential during the establishment stage of most green roof, especially if installation coincides with the hotter dryer Summer months (June- Aug). We suggest on an extensive sedum green roofs a permanent irrigation system is not necessary, but consideration must be paid to the roof and supplementary watering if periods of prolonged drought (2 weeks) occur. The deeper the substrate used the more moisture it can hold to ensure plant survival during dry periods.